Gardening with dark colors can be an exciting idea for gardeners who want to experiment with something a little different. 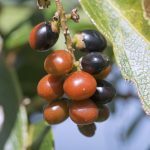 If learning how to use dark foliage plants piques your interest, you may be surprised at the dazzling array of choices. Read on for a few examples of burgundy foliage plants, black foliage plants and plants with dark purple leaves, and how to use them in the garden. Black mondo grass – Black mondo grass produces dense clumps of true black, strappy leaves. 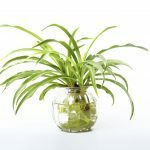 Mondo grass works well as a ground cover and is also happy in containers. Suitable for zones 5 through 10. Smoke bush – Purple smoke bush can be trained to a graceful, small tree or it can be trimmed to remain shrub size. 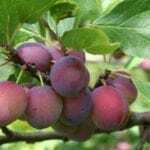 The intense purple fades to a brownish hue in late summer and then bursts forth with bright red and orange in autumn. Suitable for zones 4 through 11. Eupatorium – Eupatorium ‘Chocolate,’ also known as snakeroot, is a tall, striking prairie plant with foliage of maroon so intense it appears nearly black. White blooms provide stunning contrast. Suitable for zones 4 through 8. Euphorbia – Euphorbia ‘Black Bird’ boasts velvety leaves that look nearly black when exposed to full sunlight; looks great in borders or grown in containers. Suitable for zones 6 through 9. 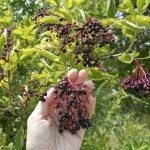 Elderberry – Black lace elderberry shows off purplish-black foliage with leaves that resemble Japanese maple. 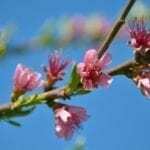 Creamy flowers appear in spring, followed by attractive berries in autumn. Suitable for zones 4 through 7. Colocasia – Colocasia ‘Black Magic,’ also known as elephant ear, displays gigantic clumps of huge, purple-black leaves measuring up to 2 feet long. Suitable for zones 8 through 11. Heuchera – Heuchera is a hardy perennial available in many colors, including varieties with striking dark foliage. For example, take a look at ‘Cajun Fire,’ ‘Dolce Blackcurrent,’ ‘Villosa Binoche’ or ‘Beaujolais’ to name just a few. Suitable for zones 4 through 9. 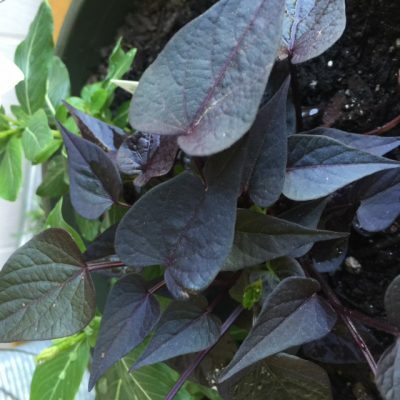 Ornamental sweet potato – Ipomoea batatas ‘Black Heart,’ familiarly known as black sweet potato vine, is a trailing annual plant with purplish-black, heart-shaped leaves. Black sweet potato vine looks great is containers where it can cascade freely over the sides. Ajuga – Ajuga reptans ‘Burgundy Glow’ shows off intense color in full sunlight. See also ‘Purple Brocade’ for foliage tinged with purple or ‘Black Scallop’ for intense, purplish-black foliage. Suitable for zones 3 through 9. 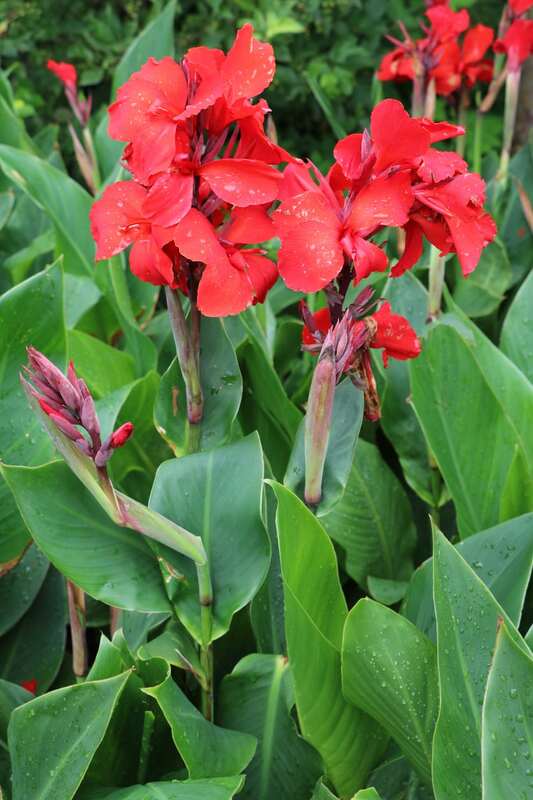 Canna – Canna ‘Red Wine’ displays deep burgundy foliage with bright red blooms. See also Canna ‘Tropicanna Black,’ with deep purple leaves, and ‘Black Knight,’ with green and black foliage. Suitable for zones 7 through 10, or can be lifted and stored during the winter in colder climates. Pineapple lily – Eucomis ‘Sparkling Burgundy’ is a long lived plant with exotic, tropical-looking foliage. The plant turns deep green when in bloom, then back to deep burgundy as the flowers fade. See also Eucomis ‘Dark Star,’ a deep purple variety. Zones 6 through 9. Aeonium – Aeonium arboretum ‘Zwartkop,’ a succulent plant also known as black rose, produces rosettes of deep maroon/burgundy/black leaves with bright yellow blooms in winter. Suitable for zones 9 through 11. When it comes to gardening with dark foliage, the key is to keep it simple. Dark foliage plants (as well as black flowers) are striking, but too many can be overwhelming, thus completely defeating your purpose. One dark plant on its own stands out as a focal point in the garden, but you can also combine a few dark plants with bright annuals or perennials to highlight both. Dark foliage plants can really stand out when planted strategically amidst light-colored or silvery foliage plants. Dark plants show up best in full sunlight and tend to blend into the background in shade. However, not all dark plants do well in sunlight. If you want to plant dark plants in a shady spot, consider displaying them with contrasting, white or silvery foliage plants. Keep in mind that most plants with dark foliage aren’t pure black, but they can be such a deep shade of red, purple or maroon that they appear black. However, the depth of the color may vary depending on soil pH, sunlight exposure and other factors. Most importantly, have fun and don’t be afraid to experiment!